I'm using an older version of the Aris css file, version 1.5.3. Up until FF v 62.0 everything was fine. Now when I hover the cursor over one of the listings in the Menu Bar, it turns dark blue. It still works otherwise but I would like to get it back to how it was before. In this pic I am hovering the mouse over "Bookmarks". Before FF 62.0, it would highlight whatever I hovered the mouse over, but I would still be able to read it. When I go to Customize and change the Theme to Light, it works properly again, but the Light theme seems a bit bright for me, as shown in the pic below. 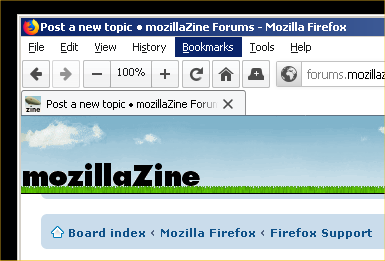 I am again hovering the mouse over "Bookmarks". Short version: On the default theme (the grey color theme) I can't read whatever menu item I am hovering the mouse cursor over. I just found this at the GitHub Aris site, and it seems like it might be the solution. But it also seems in the wrong format. Well I'm now using the latest userChrome.css and userContent.css and same issue. Is there a link to download everything that goes in the Chrome folder in my profile folder? config, css and image folders. When I first started using the Chrome folder, there was a download that had everything that went into the Chrome folder. It was just unzip and drop it all in the Chrome folder. OK, I fixed it. Apparently it needed the whole new release of the Chrome folder innards. Might wanna add this link to the sticky... along with the other one. For all you lazy folks like me, just get the complete: custom_css_for_fx_v2.0.5.zip from the top link in this post. This is my preferred way of tweaking Firefox. 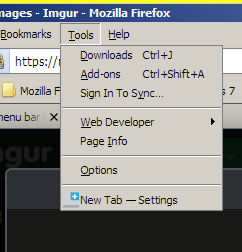 With Firefox 62 the menu issue has been corrected. No need for extra CSS. 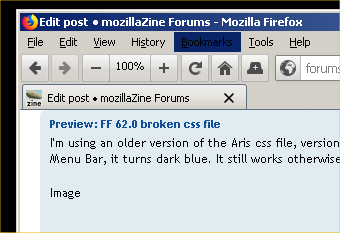 It's possible with the older Aris CSS it might have been contributing to the issue with 62. [/* @import "./css/toolbars/menubar_alternative_menu_hover_color.css"; /**/] ...line in userChrome.css of the new custom_css_for_fx_v2.0.5.zip package, and the text color stayed it's correct white color. ...but at least it's legible now, when FF is set to default grey theme. When you get a CSS file from Github, you always have to use either a "release" (ZIP) archive or the "Raw" code page. The nice-looking page where you can find the Raw button is not pure CSS. Yeah. Figured that out the hard way. It's pretty hard to find the "release". Anyway, got it pseudo working (white text on blue highlight). Would be nice to have it back to normal, aka, black text on grey. Would also be nice to see a guide for how to apply "code snippets", to the "release" package successfully. I've discovered that it's a fairly complicated process. In the "release" packages, there are a series of "nested" css files. The code that gets pasted on here looks like the code in the nested css files, rather than the code in the "release" userChrome.css file. If you look at https://www.markheadrick.com/firefox/fi ... appearance I put Aris's stuff in it's own directory and I load what I want using my userChrome.css. When a new release comes out I'll make a new /classic###/ directory and do a search/replace to change the number in my file. Makes updating a bit easier and I can switch back to older versions fairly quickly if I need to. I put my own overrides to Aris's code in my userChrome.css after importing his files so I don't have to touch his files. I'll only go to a newer release if I notice something breaking. I think you're probably a bit better at this css stuff than I am. I feel "able" to handle his "release" package, and just enable or disable the items I want. I read through your solution when you linked it before. It's a little too much for me. I can sort of understand your method, but I think you have a deeper understanding than I do. In fact, I wish Aris or someone, would release a css method with a GUI and some check boxes. Sort of like the old Classic Theme Restorer. That was more my speed. I appreciate everything, everyone has done to allow some deeper customization, I just wish they made it a bit less complicated. Maybe a Classic Theme restorer that could handle plugins or some such, for when Mozilla starts changing everything again.